Free Sample! Get it Now! 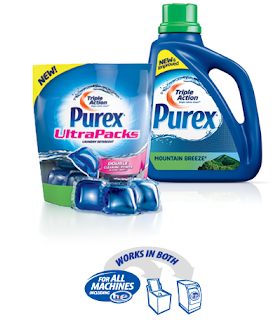 I already ordered this free sample of purex ( I chose the ultrapacks ) and got it in the mail in about 10 days. That is pretty fast for a sample. It was one totally free load of wash, and fun to try! Also it would be convenient to just keep the sample pack around for when you have to go to the laundry mat for clothing or blankets that you don't want to or can't wash in your own machine. Lugging the entire jug of detergent to the laundromat is pretty inconvenient if you don't have to. (I always have to bring the larger blankets in our house to the laundromat as our machine is pretty small) So if you want a sample of purex just click here and tell em where to send it!